In my systems thinking PhD course, I have recently been tasked with identifying a Microsystem and then evaluating the components that it is comprised of. In this effort, I have chosen to evaluate “The Online Instructor” as a Microsystem and analyze internal and external factors that influence or impact this system. This blog post is one in a series of posts that will continue to analyze the online instructor as a microsystem and should be considered a work in progress. You comments and suggestions for improvement are greatly appreciated. At the micro level, the factors that directly influence the online instructor include: the institution where the faculty member is employed, the students, peer faculty, instructional design and course content, and the instructor’s own facilitation skills. Due to the complexity of the system and the details surrounding the elements that influence it, this week’s post will focus primarily on the elements of the institution and the online instructor’s students. By exploring these areas in detail, we find that they each impact the online instructor in a number of ways. Institutional support and readiness related to online learning are key factors that directly impact an online faculty member. In order for an institution to be prepared to support online education, there are many key factors that must be considered. Institutions that have successfully implemented online campuses or virtual course offerings usually have several things in common. As a first example, successful implementation of these types of programs typically begins with senior leadership support. In these cases distance education is seen as a key element of the strategic plan for the university. Secondly, these have the needed support from their legal department, faculty committee or senate, and administration to enable them to create and implement policies that support distance education and the faculty who teach online. Policies may already exist or may need to be developed related to intellectual property, the family education rights and privacy act or FERPA, the American’s with disabilities act or ADA, copyright compliance and others. The third example related to an institution’s online programs are the degree to which they are supported with technology infrastructure, support staff (help desk), professional development programs, training, and instructional design support which can all impact and assist faculty in the creation of high quality online courses. Students may enter higher education with a variety of skills and abilities, varying financial pressures, and very different levels of motivation. When students choose an online program of study, they need to consider their level of technology readiness as well as their ability to self regulate their own learning. As students enter online education for the first time after being taught in the traditional classroom they need new skills to adapt to the change in learning environment. As similar tale is told of the young student going off to college, as she enters the lecture hall filled with 500 students rather than being one of 25 receiving personalized attention. Yes, the online environment can lead to feelings of isolation, but when faculty utilize facilitation skills that truly “humanize” their online course and establish a rich forum for communication with the instructor and peers it transforms the online course into a rich and robust online learning community. The rising cost of higher education and the growing student debt bubble is putting additional financial pressures on potential students as they consider the true costs and the ROI of a degree. No longer is it simple mathematics (student X + education Y = increased earnings over time Z). The changing job market is adding pressure to the situation, making the choice regarding whether or not to pursue a degree a difficult one. Extrinsic motivation comes from outside of the individual. Whether a threat of punishment or receipt of a reward, extrinsic motivations can be powerful. However, in the absence of the external stimuli some learners often become less motivated. Engaging learners in competition is one way to draw them in and tap into their extrinsic motivations. Interest or enjoyment in a task is often referred to as an intrinsic motivator. Intrinsically motivated students are motivated to learn for a variety of reasons. These students may want answers to their own unanswered questions, may be competitive in nature, or might simply desire self-improvement. Students who are intrinsically motivated prefer being autonomous, are usually self-regulating learners, are often determined, and are interested in mastery of topics. Self-regulated learning refers to the learning that comes from the influence of students’ own feelings, thoughts, and behaviors that are oriented toward reaching their personal goals (Artino, 2008). Self-regulated learners are sometimes quite determined to achieve a goal and will bounce back from failures more easily. These leaners are more likely to engage in tasks for a greater length of time, and think deeply about the tasks in which they are engaging (Cheng & Yeh, 2008). 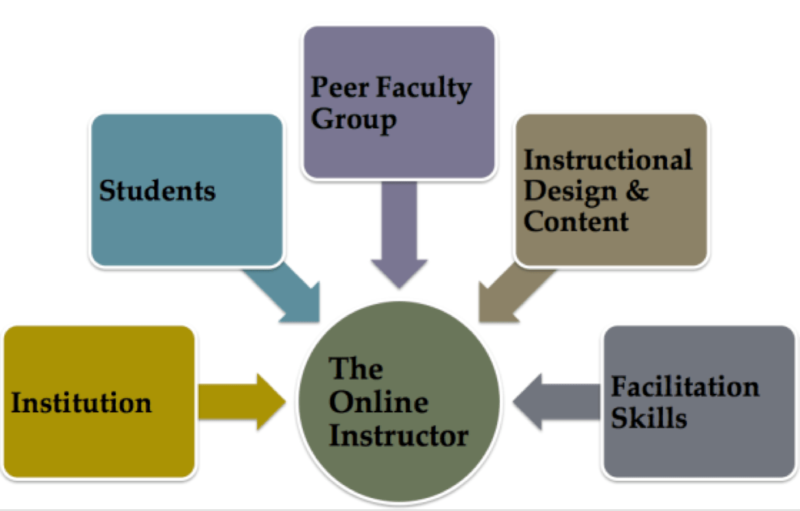 An online faculty member is influenced in a variety of ways by peer faculty. These can be seen in mentoring or support, recognition of excellence in online teaching, research funding, or acceptance of the online instructor as a valuable contributor to the faculty at large. Training programs for faculty typically include ways of teaching online, use of technology to improve student learning outcomes, and pedagogical principles of effective online teaching. A large number of institutions have created programs for online faculties that are required for completion prior to teaching online for the first time. These programs are typically blended in delivery and assist the instructor in making the transition from teaching as a face to face instructor to teaching online without making the assumption that faculty understand effective online teaching. Recognition of excellence in online teaching is also a factor. There have been numerous studies undertaken which look at the power of praise. It is essential to recognize talent in every situation and online teaching should be no different. This can be done in a variety of ways in higher education. Awards and recognition in the tenure process are obvious methods but some institutions are being creative by offering monetary rewards for faculty who scale their courses to a larger audience and by funding research regarding the efficacy of online education. This commitment by institutions to the scholarship of teaching and learning online is one factor that contributes to the success of faculty teaching in this mode of delivery. Faculty members who engage in research and publishing about online education help to broaden the base of information about the field and give back to the larger community of online educators. As with any peer group, acceptance is important to the participants. Online instructors should be included in all events that face-to-face faculty and blended faculty participate in. There are a few issues related to how textbooks used in online courses have impact on the online instructor. These are: (1) online instructors are often not involved in the decision making process when it comes to choosing textbooks, (2) digital resources that are available to the online instructor, (3) evolution of the textbook to an e-book, (4) and the rising cost of textbooks. Faculty members that teach the face-to-face sections of the class often select instructional materials, which are used in online courses. Inclusion of the online instructor in the decision making process or allowing them to choose different instructional materials for the online version of the course is important. Many textbooks today come with digital materials to support the online instructor in the creation of their online courses. However, there is a recent and growing shift to digital or eBooks by the higher education publishers. Brian Kibby, president of McGraw Hill, announced in fall of 2012 that all instructional materials would be in digital form within three years. There has also been an increase in publishers and platforms for ebooks receiving venture capital funding to obtain a portion of the “textbook pie” as this digital shift is occurring. While the move to digital textbooks is a strategic move based upon existing technology possibilities, it is important to note that recent articles have highlighted that students find textbooks too expensive and that they are not buying them. Students are making their way through classes without ever purchasing the textbooks. The transition to digital texts will also make them more affordable for the learner, which is a noble mission on the part of the publishers, one that students will appreciate. Instructor, or instructional designer, created materials are the heart of the online course. It is these elements that allow the instructor to have a sense of presence in their course. Instructor presence is one of the elements within the Community of Inquiry framework and can be enhanced by leveraging the power of learning technologies and multimedia. Instructors are leveraging the power of audio and video in their assignments and assessments, not just in the content of the course. With the advent of the MOOC, which allows instructors to “see” other online courses for the first time, these materials are getting more and more attention and in some cases are driving revamping as well. One way to reduce the costs of materials for students is to leverage open educational resources. Open Educational Resources are gaining attention as the Open Learning movement is underway. The largest challenges and barriers presented require innovative thinking in order to expand access to a global repository of learning assets that could transform higher education. Opening up access to materials that can be translated and repurposed internationally will help developing countries save on course content development, facilitate the sharing of knowledge, and address the digital divide by providing capacity-building resources for educators (Olcott, 2012). The “great” online instructor is a facilitator of learning within the online environment. They are effective communicators, give timely feedback, build rapport, have incredible instructor and social presence, and know how to set expectations and manage their time wisely. The great online instructor also remembers that teaching is learning and continually improves their course based upon their experiences of what worked and what did not. Teaching online is not for everyone, however, with the right set of facilitation skills the learning experience online can be just as good as, if not better than, those in traditional face-to-face settings. While this post may not address every challenge or opportunity within the microsystem, it is a collection of thoughts toward that end. There is much work to do to ensure that the online instructor receives the needed support to continue to deliver high quality experiences for our students. I look forward to the years ahead and being a part of that support system. Artino, A., (2008) Promoting academic motivation and self-regulation: practical guidelines for online instructors, TechTrends, 52(3), 37-45. Banathy, B. (1999). Systems thinking in higher education: Learning comes to focus. Systems Research and Behavioral Science, 16(2), 133-145. Banathy, B. (1992). Chapter two: The systems-environment model. In A Systems View of Education Concepts and Principles for Effective Practice (pp. 25-58). Englewood Cliffs, NJ:Educational Technology Publications. Cheng, Y., & Yeh, H., (2009) From concepts of motivation to its application in instructional design: Reconsidering motivation from an instructional design perspective, British Journal of Educational Technology, 40(4), 597-605. Keller, J., (1999) Using the ARCS motivation process in computer-based instruction and distance education, New Directions for Teaching and Learning, 78. Olcott, D. (2012). OER perspectives: emerging issues for universities. Distance Education, 33(2), 283-290.